There are three Saints in the Martyrology for today who are particularly interesting cases in the annals of Catholic hagiography. Two of these are Ss Quiricus and Julitta, a three-year old boy and his mother who were martyred during the persecution of Diocletian. Julitta was a wealthy noblewoman from Iconium in central Asia Minor, who fled from persecution in her native city to Tarsus in Seleucia, only to have the persecution break out there on her arrival. She was tried, condemned as a Christian, and sentenced to be racked. Quiricus was then separated from his mother, but in a place where he could see what was happening to her. As she cried out in the midst of her sufferings “I am a Christian!”, Quiricus cried out “I am a Christian too!”, and proceeded to have what modern parents would call an epic toddler meltdown. As the governor who presided over the trial tried to calm him down, but still keep him from his mother, and lead him to deny the Faith, Quiricus kicked him and scratched him in the face, at which the governor picked him up and dashed him against the floor, killing him instantly. Mother and son were widely venerated as martyrs together after the persecutions ended; there is a church dedicated to them in Rome at the edge of the Monti region, very close to the Imperia Fora. 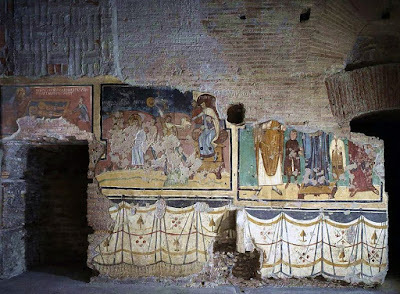 This episode is famously represented in one of the side chapels of the church of Santa Maria Antiqua, built into a part of the imperial palace in the Roman Forum in the 5th century. The frescoes are from the mid-8th century. The church of Ss Quiricus and Julitta in Rome. The edition of Butler’s Lives of the Saints revised by Fr Herbert Thurston, S.J. and Donald Attwater is often highly critical of the legends of the Saints, frequently describing them with terms like “worthless” or “fabulous” in the sense of “a fable.” But even they say that “(i)t is distressing to have to discard a story so piously credited… in the East and West.” This is partly because there so are many different versions of their passion; already in the early 6th century, the document known as the Gelasian Decree mentions them twice as Saints whose apocryphal acts are not read by the Roman church, “lest even a slight occasion for mockery arise.” The term “apocryphal” in the context of this decree simply means that the books were not approved to be read in church, which is to say, to be read in the liturgy; nevertheless, it is significant that only one other “passio”, that of St George, is so noted. Today is also the feast of St Benno, who was bishop of the German city of Meissen for 50 years, from 1066 to 1106. Very little is known of him historically, but popular legend makes him a model bishop in the age of the great reforms championed by his contemporaries such as Ss Peter Damian and Pope Gregory VII; to him is attributed, among other things, assiduous attendance at and care for the proper singing of the Divine Office. According to one story, when summoned to attend a council called by the Emperor Henry IV in order to depose the Pope, St Benno gave the keys to the cathedral to his canons, and ordered them to drop the keys in the river as soon as they should hear that Henry had been excommunicated. (The purpose of this would be to keep the supporters of the Emperor from taking possession of the church.) When the controversies between the Pope and Emperor had die down, St Benno returned to Meissen, and the keys were recovered by a fisherman who found them tangled in the gills of a catch, and brought them back to the Saint. A reliquary of St Benno in one of the side-chapels of Munich Cathedral; click to enlarge and see the fish in his left hand with the keys in its mouth. St Benno was canonized in 1523, just as the Reformation was getting into its first full-swing; Meissen and Luther’s city of Wittenberg are both in Saxony, and both on the river Elbe, which kept Benno’s cathedral keys safe for him. The canonization was seen by Luther as a purely political move designed to halt the Reformation in Saxony, and he responded to it with a more-than-typically nasty polemical treatise “Against the New Idol and the Old Devil About to be Set Up in Meissen,” in which he brutally calumniates both St Gregory VII, and the contemporary Pope, Hadrian VI. In 1539, when Meissen turned Protestant, Benno’s relics were rescued from a mob that would have destroyed them, and about 40 years later brought to Munich, where they were installed in the Cathedral. He is therefore venerated as the Patron Saint of Munich, and, as of 1921, also of the re-established Catholic See of Dresden-Meissen. Another representation of St Benno in Munich, in the church of St Peter.